Government allows family of dying international student to visit him in Melbourne after public outrage over visa rejection. Some good news in tragic circumstances. The mother and brother of a dying Pakinstani man, who was studying in Melbourne and is too sick to fly home, will be able to say goodbye in person after the Australian Government did a backflip and approved their travel visas. Hassan Asif’s wish to spend his final days with his family was dashed when their initial visa applications to fly to Australia were rejected after The Department of Immigration found the pair were a risk of overstaying their visa, sparking a public outcry. But the 25-year-old, who was diagnosed with terminal skin cancer after coming to Australia to study, will now be able to be comforted by his loved ones. Today, a spokesman for Immigration Minister Peter Dutton confirmed the family had been permitted to fly to Australia, Fairfax Media reports. 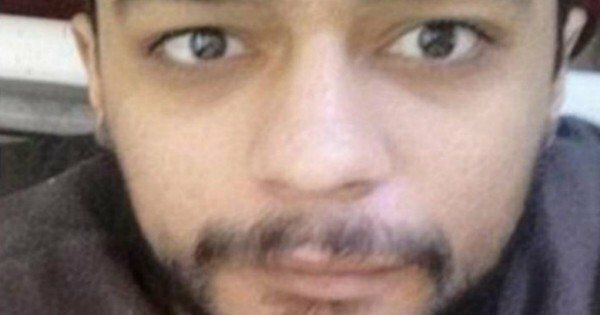 Hassan Asif has just weeks left to live. Weeks he should be spending with his loved ones by his side. Weeks he should be spending embracing them and holding their hand, being comforted by his mother, being given the dignity that all human beings deserve. But this 25-year old will die without his family, without his mother, without his brother, all because the Immigration Department believes they don’t “satisfy Australia’s visitor visa requirements”. Last month Hassan entered the terminal phase in his cancer. 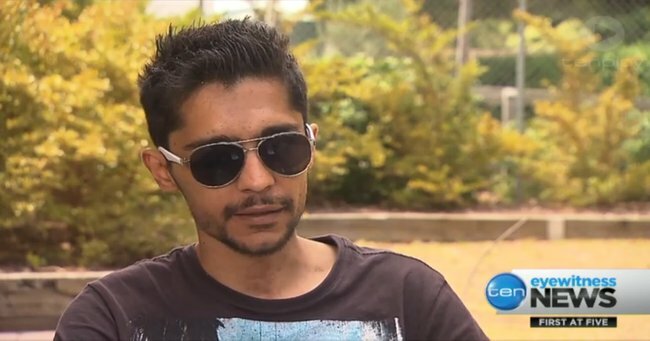 Hassan Asif came to Australia on a student visa last year. He has been studying Architecture in Melbourne but in April faced the difficult news that he had advanced skin cancer. Last month the promising young student entered the terminal phase. As he dies, Hassan has said all he wants is for his mother and brother to be with him for his finals weeks, but an application for their visa was rejected on the grounds they might overstay their welcome. 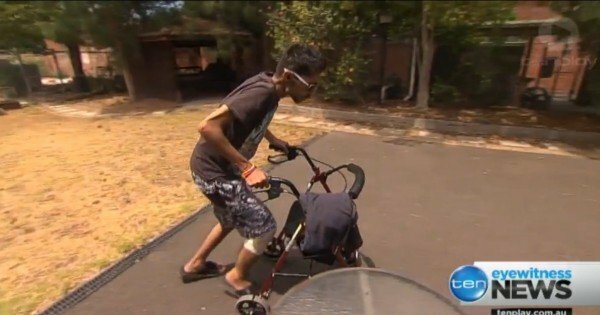 Hassan told The Daily Mail that if he could speak with Immigration Minister Mr Dutton, he would say: “This is my last days and I’m dying and I just want my family to be here with me. Hassan told News Limited: “They are my family, I want them to be with me in those last days. “I’m missing my mum very much. I’m OK with dying, it’s just the pain and everything, it’s getting so hard. “The compassionate nature of the proposed visit by his mother and brother was considered, however, anyone wishing to visit Australia must satisfy Australia’s visitor visa requirements, including health, character and genuine temporary stay requirements. “The likelihood of an applicant overstaying or seeking to remain permanently in Australia is also a matter that must be assessed. Particularly in compassionate circumstances, a decision-maker takes all of the facts of a particular case into consideration. Hassan’s brother Rameez Asif told The Herald Sun it was tearing the family up. “No one could understand what we are going through because he is the youngest in the family and to see him in this condition is just unexplainable,” he said. He told the newspaper that they had no plans to stay in Australia. “We have our home, family and relatives here in Pakistan and the only reason why we want to enter Australia is to be with Hassan again,” he said. Melbourne City Mission, who has taken Hassan under their wing, said that Hassan’s mother was devastated, that all she wanted was to be with her son. In a statement on its website, the Mission urged Immigration Minister Peter Dutton to review the decision. It stated that Mr Asif had no family or community ties in Australia. 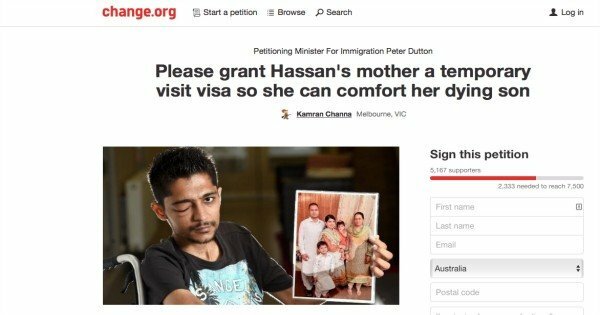 On their page Hassan’s Dying Wish, Melbourne City Mission listed a variety of ways you can help including writing to the Immigration Minister, Peter Dutton. You can sign a petition to Mr Dutton here.